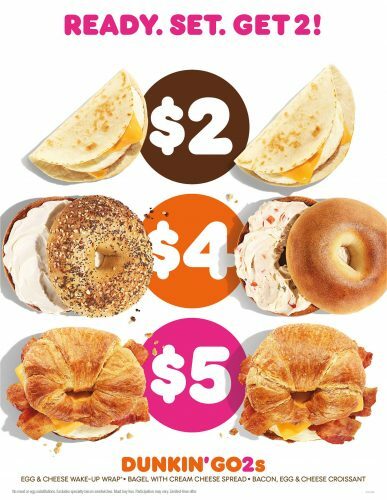 Dunkin’ has a new value menu with popular breakfast menu items priced starting at 2 for $2. Power Breakfast Sandwich: Features a veggie egg white omelet with spinach, peppers and onions, turkey sausage and American cheese on a new, thin seeded multigrain sandwich bread. At under 400 calories, the Power Breakfast Sandwich is made with eight whole grains which contribute 20 grams of whole grains, has 24g of protein, and has no artificial flavors or dyes and no high fructose corn syrup. Dunkin’ is also bringing back two favorites introduced in 2018. The Brown Sugar Chipotle Bacon Breakfast Sandwich offers a double portion of caramelized brown sugar chipotle bacon – made with real brown sugar and chipotle seasonings – along with egg and cheese served on a buttery, flaky croissant. Meanwhile, for a treat for donut lovers, the Caramel Chocoholic Donut features a classic chocolate donut frosted with caramel icing, sprinkled with semi-sweet chocolate curls and finished with a drizzle of caramel icing. Dunkin’ announced the new specials on the Dunkin’ News Page. Dunkin’ Donuts is an international doughnut and coffee retailer founded in 1950 by William Rosenberg in Quincy, Massachusetts; it is now headquartered in Canton. Despite originally focusing on doughnuts and other baked goods, over half of Dunkin’ Donuts business today is in coffee, making it more of a competitor to Starbucks as opposed to traditional competitors Krispy Kreme and Tim Hortons. The company has more than 9,800 locations in 31 countries worldwide, which include more than 6,700 Dunkin’ Donuts locations throughout the United States.